Jack Oakie must have led a chamed life or something. Best known for his take-off of Mussolini in Charlie Chaplin's The Great Dictator, Oakie was a welcome presence in countless films, on the radio and in television. Born in Missouri, the Offield family moved to Oklahoma when young Lewis was five, but spent some of the year with his grandmother in Kansas City, where he was a paperboy for the Kansas City Star. Entranced with the stage, Lewis took the name of "Jack" after the name of the very first character he played. Moving to New York at age 17, he worked his way up through the ranks, making his Broadway debut in George M. Cohan's Little Nellie Kelly in 1923. Oakie dabbled in movie bit roles out in Fort Lee in 1924, but concentrated on his stage work, finally landing a contract at Paramount, where he got sizable supporting roles in films like The Fleet's In (released in September, 1928) with Clara Bow, The Dummy (released in March, 1929), and Too Much Harmony (released in September, 1933). He played Tweedledum in Alice in Wonderland (released in December, 1933), and was in the musical murder mystery Murder at the Vanities (released in May, 1934); he headlined the variety film The Big Broadcast of 1936 (released in September, 1935), and King of Burlesque (which had its world premiere at the Chinese on New Year's Eve,1935). By now, Oakie was freelancing at all the studios. "The world's oldest Freshman", he was still playing college boys as late as Collegiate (released in January, 1936). His good-natured humor is reflected in the character names he played: Bangs Carter in Florida Special (released in April , 1936), Whammo Lonsdale in That Girl from Paris (released in January, 1936), and Honest "Ham" Hamilton in Fight for Your Lady (released in November, 1937). 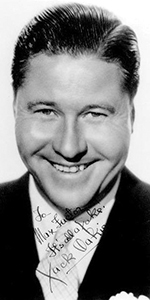 Oakie did a lot of radio, even having his own show in CBS, Jack Oakie's College (he played the president of the college), from December, 1936 to March, 1938, which was broadcast from the CBS studio in Hollywood Tuesday nights. Former Chinese Theatre Orchestra conductor Georgie Stoll was musical director on this show. Oakie is well-remembered for his gleeful impression of Italian facist Benito Mussolini in Chales Chaplin's The Great Dictator (which played the Chinese in April, 1941). Oakie got an Oscar nomination for the role, but lost to Walter Brennan in The Westerner). Supporting player to both Betty Grable: Song of the Islands (which played the Chinese in March, 1942), and to Sonja Henie: Iceland (polayed the Chinese in September, 1942), Oakie was always a fixture in musicals with titles like: Hello Frisco, Hello (played in March, 1943), Sweet and Low-Down (played in September, 1944), and Bowery to Broadway (played in November, 1944). Oakie was great friends with Sid Grauman, who, the story goes, called him at his ranch one evening after a hard day at the studio. Grauman told Jack that he needed to come down to the Chinese right away as the cement was setting. 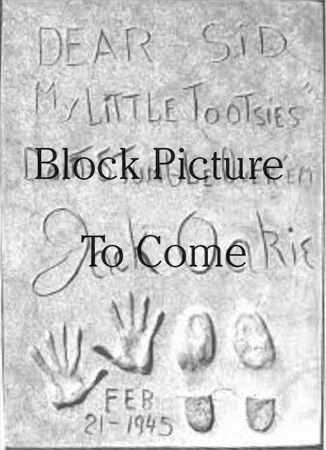 Oakie knew this was one of Grauman's notorious practical jokes. After some convincing, Oakie arrived at the theatre with Grauman telling the crowd "I told you he'd be here!" The problem with this story is the fact that Oakie was almost deaf. He was able to lip-read, which is how he got through his film career; phone calls had to be explained to him by someone who took the call for him — it could have happened . . . .
More musicals for Oakie: On Stage Everybody (released in July, 1945), When My Baby Smiles at Me (which played the Chinese in November, 1948); and historical films, like Last of the Buccaneers (released in October, 1950), and had a bit in Around the World in 80 Days (released in October, 1956). His final film was Lover Come Back (released in March, 1962). Oakie did only some television, guesting on Kraft Theatre in 1958, Studio One in Hollywood in 1958, The Real McCoys in 1963, Daniel Boone in 1966, and Bonanza in 1966. Oakie happily retired to his Oakridge estate in Northridge, tending his citrus orchards, and raising Afgan Hounds until an aortic aneurysm took him in 1978 at the age of 74. Grauman's Chinese Theatre, Hollywood, California. Jack Oakie Forecourt ceremony, Wednesday, February 21, 1945. 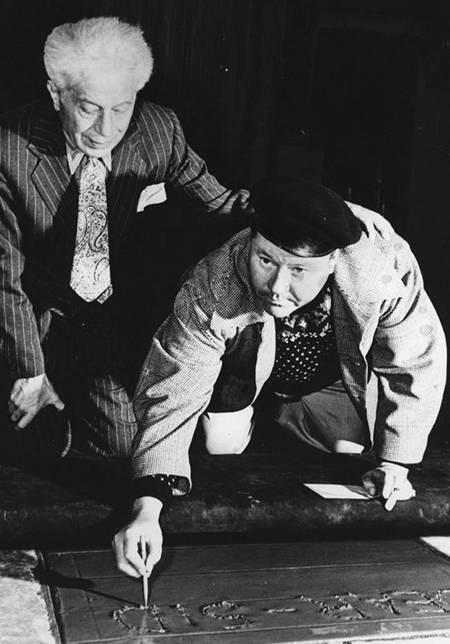 Sid Grauman looks on as Jack Oakie makes his inscription.